Acumen Athletics: Engraving Methods: Finding Range With The Long Guard. Engraving Methods: Finding Range With The Long Guard. For this months Engraving Methods, I used a clip I took from "MR. Knockout" Thepnimit vs DaoFai rematch fight at Channel 11 Stadium in Bangkok. In this episode I slowed down Thepnimits use of his long guard. Thepnimit used the long guard from in the clinch to deliver a pummeling elbow, then long guards again, DaoFai backs up to avoid another elbow, Thepnimit notices the range and throws a mean cross that pushes DaoFai back. 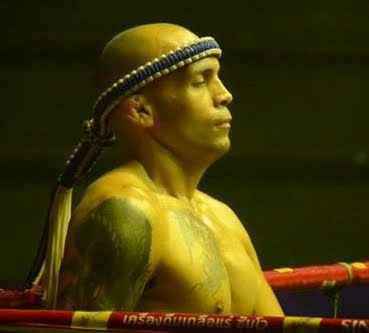 DaoFai showed tremendous resilience weathering Thepnimit's hail of uppercuts, hooks & low kicks. I was certain DaoFai wasn't going to be able to stand for the 3rd round but the man is a machine. Round 3 & 4 was more of a clinch battle with both guys throwing hard knees & whipping elbows. DaoFai managed to win by points but none the less a great display of power and heart by both warriors. The long guard is a versatile tool that every nak muay should acquire in their game. It can be used offensively to control, off balance and set up an attack. It can also be used defensively as a block or a push to regulate your opponent's attack and minimize their power.